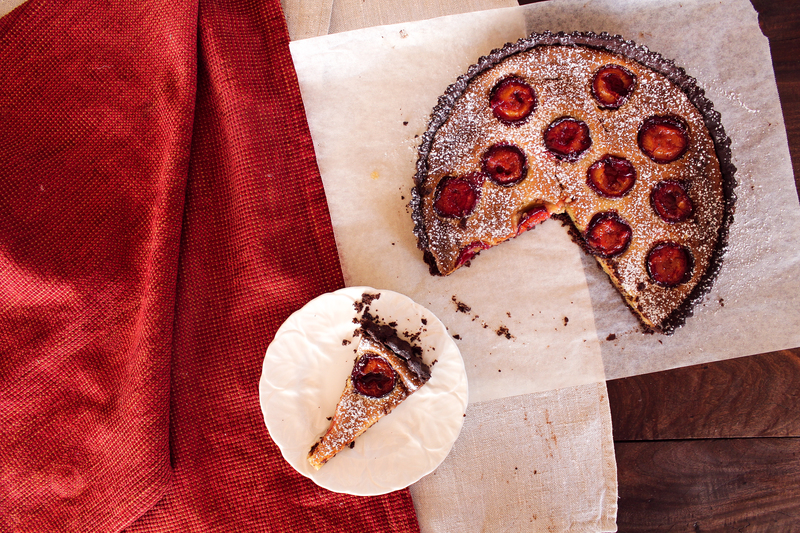 Behold one of the most versatile tart recipes ever. 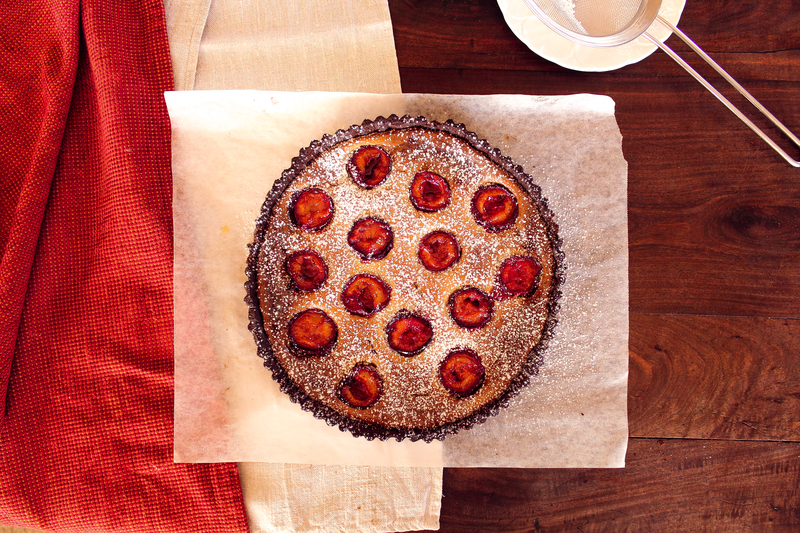 Using Dorie Greenspan’s basic recipes for ‘Sweet Tart Dough’ and ‘Almond Cream’, as found in her legendary book ‘Around my French Table’ (highly recommended), you can create so many variations of this beautifully fruity, rich, silky tart. 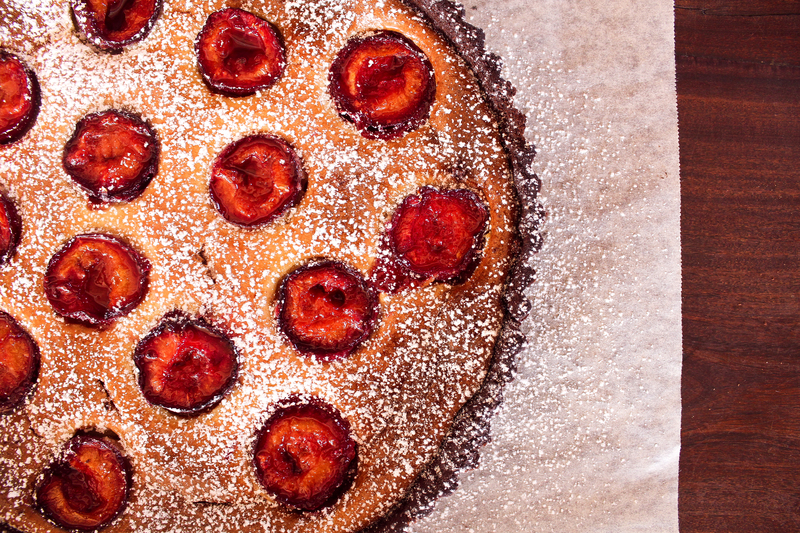 I used her chocolate variation of the tart shell, and the result is a crumbly, rich, slightly bitter base that is the perfect carrier for this creamy almond frangipane filling, and the juicy plums nestled within. I have soaked the tart in warm honey to finish, which gives an already beautiful dessert an irresistible glow. 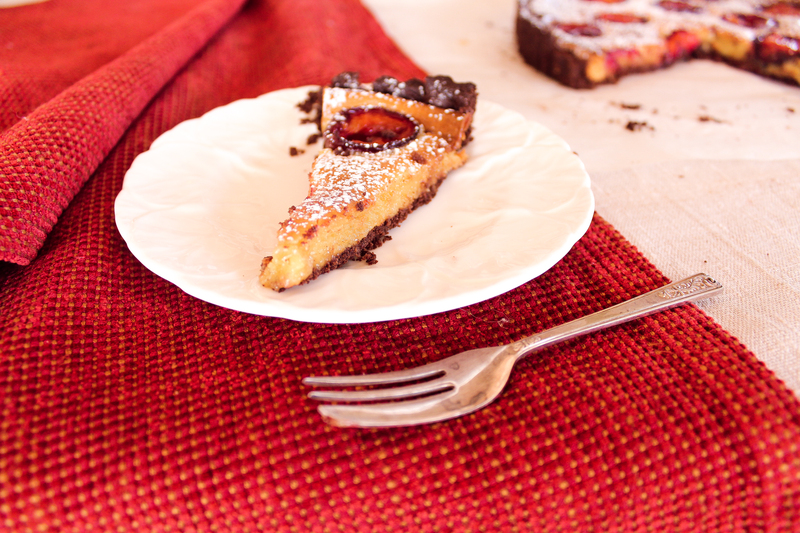 The tart is rich but very thin, so I found it be the perfect amount of indulgence! There are infinite possibilities for the types of fruit you could use as a substitute for the plums; nectarines, peaches, cherries, figs, pears…let your mind wander. If using a firmer fruit such as pears, I would recommend buying them tinned or gently poaching the fresh fruit yourself, to ensure they are soft by the end of baking time. Or you could just go ahead and use this recipe! Serve the tart warm with a scoop of good quality vanilla ice cream and a cup of tea. Grease a 23cm/9 inch round tart tin with butter. In a mix master with a dough hook or a food processor, pulse the flour, cocoa, icing sugar and salt a few times to just combine. Preheat the oven to 180°C/375°F fan-forced, and bake the tart shell from frozen on a centred rack for 20 minutes. Remove the foil and weights and, if the base of the shell has puffed up, press it down gently with the back of a spoon. Bake for another 3-5 minutes until slightly crisp. If the sides of the shell look like they are cooking faster than the base, cover them with strips of foil before returning the shell to the oven. The last 3-5 minutes of baking should ensure that the base bakes to be just as dark. Remove the shell from the oven and leave to cool completely. Combine the butter and sugar in a food processor for 5 minutes until smooth and silky. If you don’t have a food processor, use an electric whisker. Add the almond meal and process for a minute to combine, then add the flour and cornflour and process again. Add the egg and vanilla and process for another 30 seconds until the mixture is completely smooth and combined. If possible, cover and refrigerate the frangipane for about 2 hours, until it firms up. This step is not absolutely necessary, but preferred. You can store the frangipane in this way for up to 3 days. Preheat the oven to 170°C/350°F fan-forced. Spoon the frangipane into the cooled tart shell, using a metal spatula or butter knife to smooth the surface. Wash, dry and halve the plums, before pressing them cut side up into the frangipane. You don’t need to press them right to the bottom of the tart, just give them a jiggle so that they are held firmly in place. The frangipane will rise up around them during baking. Bake on the oven’s central rack for 50-60 minutes, until the frangipane is golden brown and has puffed up to the height of the tart shell. 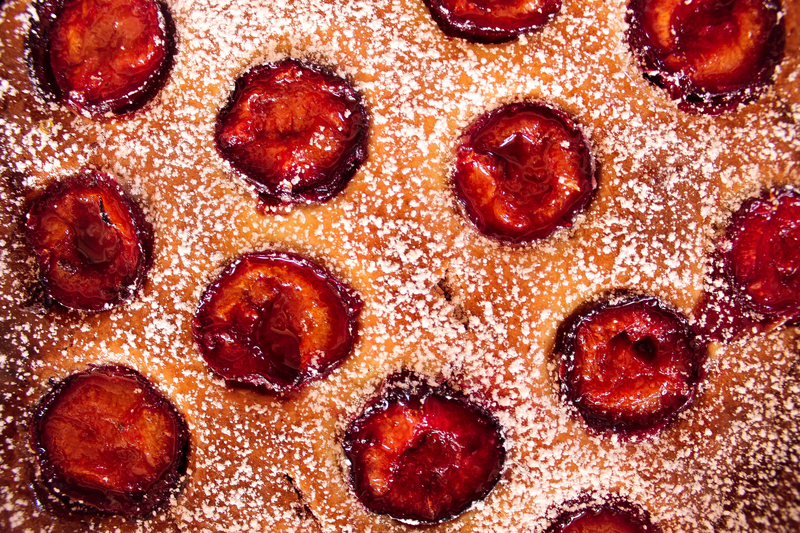 A metal skewer or sharp knife inserted into the frangipane should come out clean. Remove the tart from the oven and place on a cooling rack. In a small saucepan over low heat, stir the honey constantly for 5 minutes until runny and warm. Generously brush the surface of the warm tart with the honey. You may need to wait a few minutes for the first layer to soak in before brushing over any remaining honey. 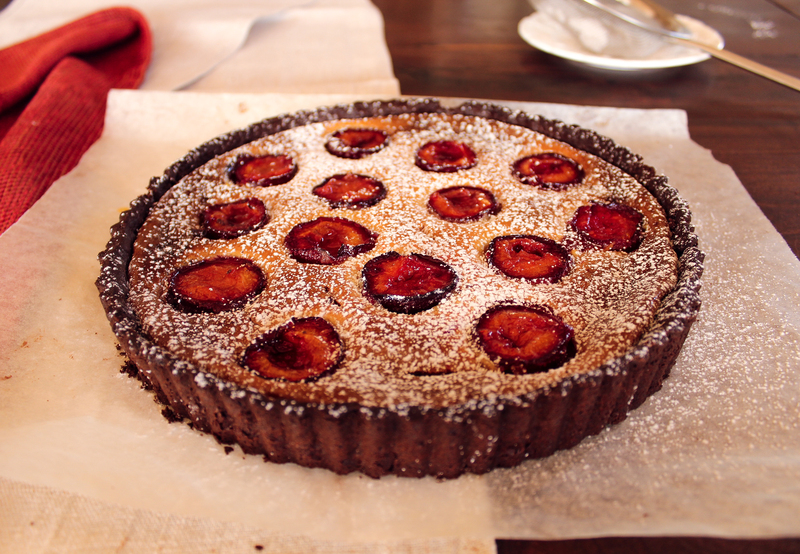 Serve the tart warm or cooled, with a generous dusting of icing sugar. Freeze the unbaked tart shell for up to 6 weeks.